We're slowly, but surely starting to see more and more Android device makers start updating their products to Nougat these days. And the latest smartphone to have such an update in the pipeline may not be what you expected. The ZUK Z2, launched by the Lenovo-owned brand this June, is going to be graced with an official Android 7.0 build. Not only that, but the update to Nougat is going to become available in the near future. Although we don't have anything more specific to go on just yet, this is a much needed confirmation of an update being worked on for the device. And it comes straight from ZUK CEO Chang Chen, so there's no doubting its authenticity. 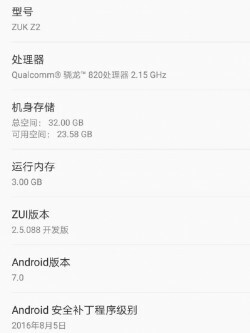 The executive has even shared the screenshot you can see to the left - showing an Android 7.0 Nougat build running on his ZUK Z2. So it's all good news for owners of the Z2, but what about the Z2 Pro? Unfortunately at this time we have no news about a Nougat update for that model, but it would make little sense for the Z2 to get the new Android version and the Z2 Pro not to. Total waste phone with below average camera, glass back, few standard features missing, etc. But will appreciate the design, battery and SD 820. Better go for Xiaomi Mi5. can you give me date for update android 7 in z2 plus in india.